Photo courtesy of terri henry marketing of the 2014 CANstruction event. The Queen Mary designed and constructed by the P2S/MHPSE team. 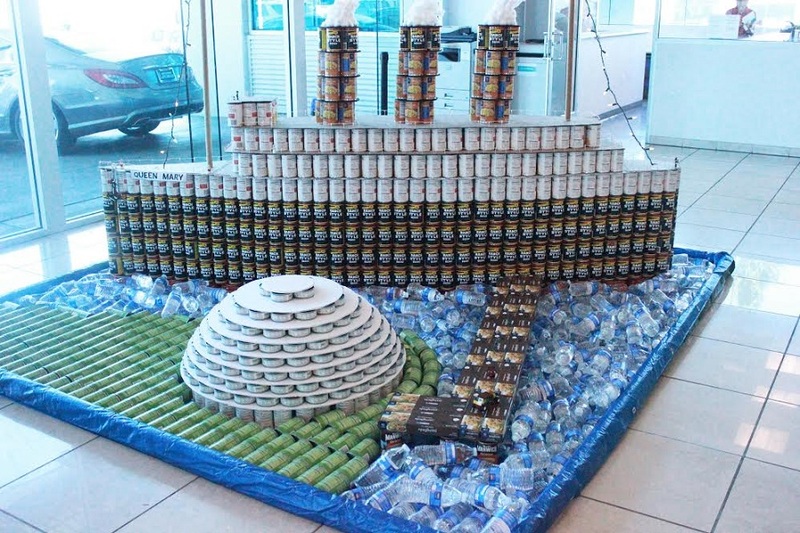 Local architectural and engineering firms are gearing up to put their design skills to the test for the second annual Long Beach CANstruction Competition to take place on Thursday, September 17. Over 10,000 lbs. of canned goods will be used to construct the 10’ x 10’ x 10’ structures and will be donated to local nonprofit Food Finders food rescue/bank to help alleviate hunger within the Long Beach community. According to the May 2015 article, CANstruction events have been held in over 140 cities across the globe, resulting in 15 million pounds of canned food collected for the cause. Five teams composed from seven local architectural and engineering firms make up this year’s participants: Environ Architecture partnering with California Resources Corp., Moffatt & Nichol Engineers, C/A Architects, P2S Engineering partnering with MHP Structural Engineers and SCS Engineering. The completed structures will be on display to the public starting Friday, September 18 and ending Sunday, September 27. Those who visit the Landmark Square Building are encouraged to bring can or two of their own to use as “votes” for their favorite CANstructed work of art. Visitors can place their cans in the Food Finders supply bins located next to each structure resulting in a “People’s Choice” award, while additional awards including “Structural Ingenuity,” “Best Use of Labels,” “Best Meal” and “Juror’s Favorite” will be chosen by a panel of local judges following the exhibition. CANstruction® Long Beach 2015 is sponsored by the Long Beach Convention & Visitors Bureau, SCAN Health Plan, Sweatpants Media, the Press Telegram and S&W Beans, who donated 510 cases of product for the build teams to use in their designs. For more information on CANstruction Long Beach, click here; to learn more about Food Finders, click here. The Landmark Square Building lobby is located at 111 West Ocean Boulevard in downtown Long Beach.